Out of the fog they came - gliding across the smooth water. All was quiet, the fog kept the sounds dulled and distant. It mid morning - much earlier than we usually arrived at the lake. Had we waited until the late afternoon, we would have missed their visit. Sometimes those unplanned outings turn out just perfect. 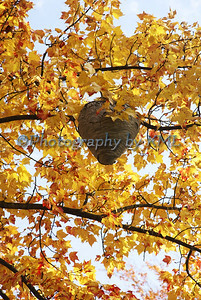 I never spotted this beehive until the fall when the leaves had changed. It then stood right out against those bright colors. I don't often take the road where it is, but the last time I went by it, it was still there - showing even more with the bare branches. 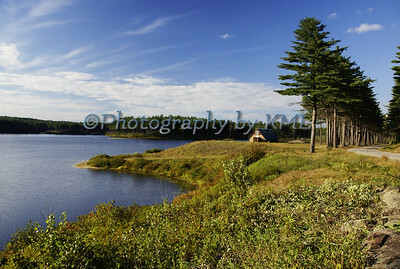 I am hoping to get there sometime this winter, I would like to catch it with some freshly fallen snow on it. 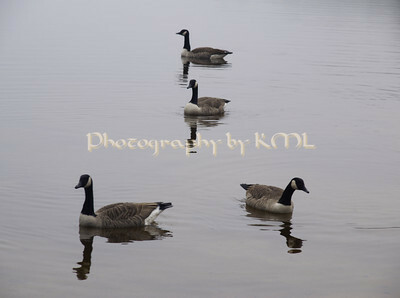 While at the lake one morning this past fall, we were lucky enough to find a small flock of Canada Geese taking a break. 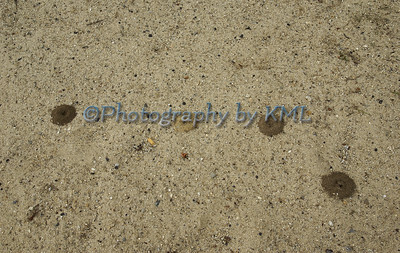 They were on the beach side, so we didn't see them when we first arrived. Walking along the grass in the fog, we heard a commotion off to our right. 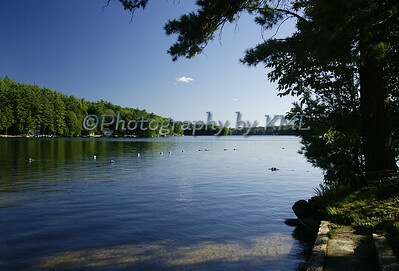 When the trees cleared, we saw them - out on the water - watching us with wary eyes. 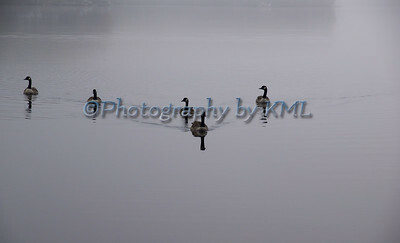 How beautiful they looked in the fog, just gliding along the top of the peaceful water. We enjoyed them for a few minutes, and left a few pieces of bread for them to eat after we left. I so love these little gifts we get from Mother Nature when we least expect them! With this letter A, we are beginning the 8th round of ABC Wednesday - almost 4 years - that is quite a long time for a meme to keep going. We owe a huge bunch of thanks to the members who donate their precious time to keep it going and and make it the special community it is. Now - on to the letter A.
Anthills - not a very interesting subject. And to be honest - I have done my share of trying to evict ants from my home and gardens - to no avail. But I will never give up the battle - I know they are needed in the circle of life, but just not in my living quarters. I can respect and admire their homes - as this photo shows. They were all built within inches of each other, and each one is a different color (if you enlarge the photo it really shows). It would have been easy to scuff them with my foot and make a lot of work for them, but I simply admired their handiwork and let them be. I wish they would do the same to ours instead of looking at it as a giant opportunity to invade and conquer. Well, the beginning of this winter season left us pretty high and dry in the snow department. Most of the snow storms kept tracking just south of the New England area, so we got very little from them. Fast forward about a month - we got one that delivered over a foot. The next week another came and gave us almost two feet. Now, not even a week later, we are going to be smacked with another foot, and to top it off, Mother Nature is going to glaze it with ice and freezing rain. And then the weatherman was only too happy to announce that Friday will bring another substantial amount of snow. Welcome to My World in New England - perhaps we will be unburied sometime before summer arrives! He's hard to find - blending in with the rock, moss, and grasses beside the lake. 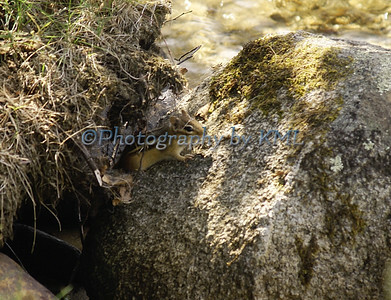 His little feet never touched the water as he darted out from under the rock that is sitting in the water. We call them chipmunks, but they are also known as rock squirrels, striped squirrels, chippers, and zizels, as I learned today. It's not one of my better images, technically, but I enjoyed his quick visit and am glad I was able to photograph him. No frogs or water lilies on these guys. 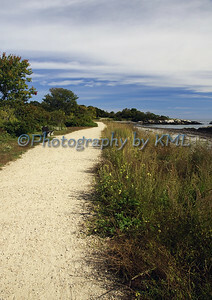 This image was taken at the beginning of fall - all the flowers had bloomed and gone. Not sure where the frogs were, perhaps it was just a bit too chilly for them. 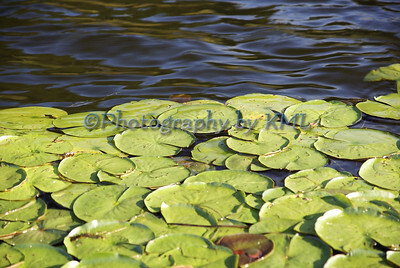 These lily pads were huddled against the shore in just this one spot. The rest of the lake was lily pad free. Our favorite swim area doesn't look a thing like this now. The water was drained down, but even if it wasn't, it is all covered with snow and ice. A few bob houses dot the horizon, but that kind of worries me. We walked along the edge a week ago, and I could hear it cracking underneath. As much as I wanted to walk towards those bob houses, I made haste to get off the area I was on. Perhaps in a couple of weeks we can try it again - without hearing any cracking. 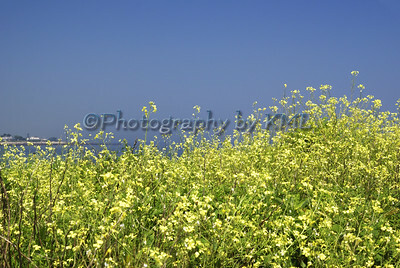 Hundreds of these little yellow wildflowers were growing alongside the ocean last summer. In the past, I have found thistle one season and milkweed growing the previous season. They are all wildflowers, but someone must be tending to them - digging up the old and putting in new ones each summer. I wonder what will be put in this spot next summer - will have to make sure we get to this area again during the growing season. I was surprised to see the thistle all gone - they have the biggest, sharpest thorns I have ever seen - must have been some pair of gloves that dealt with them! We don't usually visit this park too often even thought it is only a few miles form our home. It is a state owned park that has remained unopened over the past five years. Being that is is part of the flood plain for our area, it has seen some serious flooding and the costs for the state to fix it has been too expensive. I have even seen this land posted on a list of potential real estate to be sold by the state in the next couple of years. I find that kind of sad - it was always known as a family place with a beach, swimming, picnic tables, and bathroom facilities. The flooding has ruined the tar parking lot and it has become overgrown with brush everywhere. It's still a nice place to take a walk, but with no one around to watch it, it is safer to have a buddy with you and not be alone. It is a beautiful spot nonetheless. Wishing for all that is good as our lives begin another year on this beautiful planet. Be safe, be happy, and enjoy this special gift of life we are each given!